Sometimes following a period of intense and detailed work, requiring a high degree of concentration, I feel the need to 'let myself go'. "Bridge of Hope" is a painting of this type, where I have no pre-conceived ideas, but rather a collection of spontaneous thoughts, which lead to the eventual composition. Without a deliberate central theme, it becomes whatever the viewer wishes it to be; and is open to many varied interpretations. In fact, I allow the painting to paint itself. 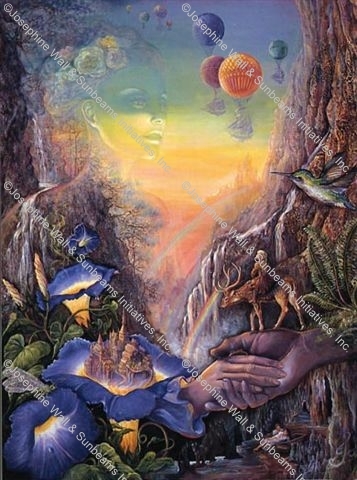 For example the hands forming a bridge across the river were initially not connected to the face in the sky, but later when I decided to paint her shoulder, suddenly, one of them became her hand. The little girl was nearly riding a bear or an elephant, but finally it had to be a deer. I have a lot of fun creating strange, surrealistic worlds where some images appear to be larger than life, such as the humming bird, flowers, ferns and hands, whilst others such as St. Michaels Mount and the couple floating along the river in the boat are much smaller. A world where the mind can roam freely, to the extent of the imagination. One interpretation could be, that mother nature is holding out the hand of hope to mankind, forming a bridge, which if we choose to cross will allow us to live at one with nature, and share the responsibility for ensuring the well being of the earth and all its wonders.